The recent full release of the Trans-Pacific Partnership (TPP) has drawn in global interest. The new trade agreement calls for improvements to human and labor rights and sets standards for environment practices. Vietnam, Malaysia, and Brunei in particular have arranged side agreements with the United States on the enforcement of TPP’s labor standards. These nations all have uniquely challenging labor climates that may prove difficult for rapid reforms. 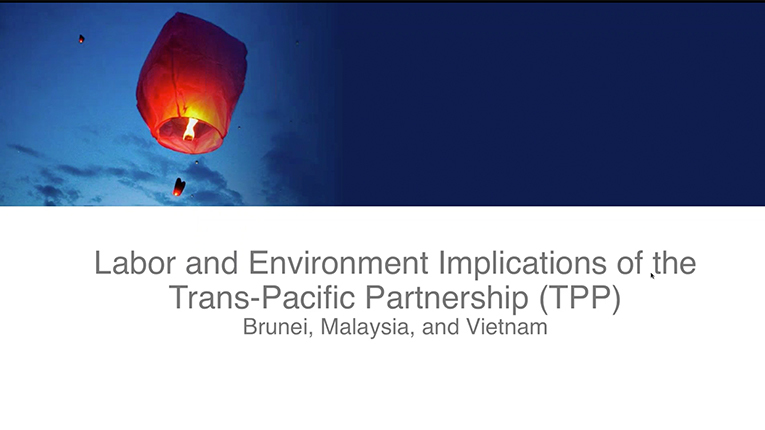 We are happy to invite Mara Burr as our guest speaker and trade expert for this webinar to share insights on how TPP will impact these nations. Mara is a trade expert with over 18 years of experience in international trade and investment issues. She was in various roles as lead negotiators in labor and environment provisions, particularly in her role as Deputy Assistant United States Trade Representative for Environmental and Natural Resources and Deputy Assistant United States Trade Representative for South and Central Asian Affairs. What are the current challenges to environment and labor reforms? What are prominent labor issues as shown in our assessment database? What do the labor provisions mean for these three countries? What are some effective measures to take in order to support the adjustment to new standards?